Gray is the new black. Just kidding, but it has been really popular the past few seasons. That's particularly true for soft pale grays like this one. It has the benefit of being both neutral and also a little bit unusual, and the combination of materials gives the texture extra dimensionality. The overall shape of the Alpha is very traditional, but it has some very unique details. The multiple top handles aren't just beautiful, they're also super practical. The shorter handles are great for hand holding and the longer, wider strap is good for throwing over your shoulder. The stitch panel detail is subtle, but beautiful. As usual, Alexander Wang has stayed below the usual designer price point on the Alpha, and $495 really doesn't seem like that much to pay for a modern classic. 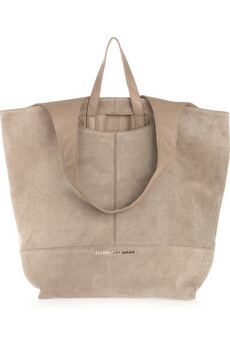 The Alexander Wang Coco Duffel Bag, a larger alternative to this bag.